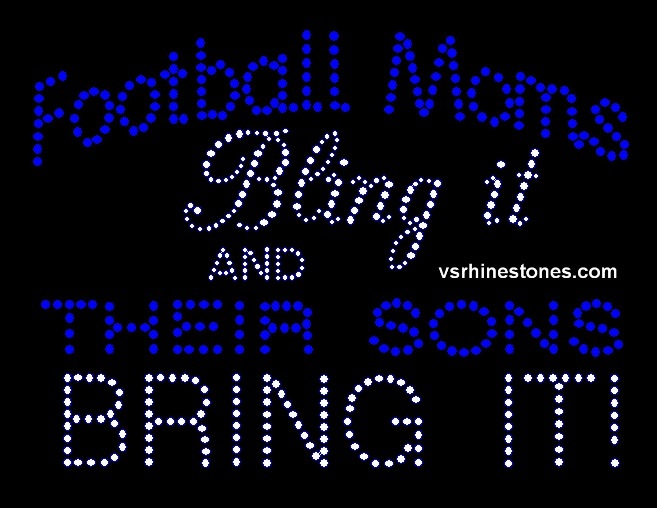 Football Moms Bling it and Their Sons BRING IT Rhinestone Transfer is 7.5 x 5,5. This rhinestone Motif is made of Clear rhinestones and your choise of colored rhinestones. Set your heat press temperature at 325° Fahrenheit. Set your heat press pressure at medium to heavy. Remove the white plastic backing from the rhinestone transfer. Place the rhinestone transfer face up on the fabric. You will be pressing directly onto the clear, heat-resistant film. Press again directly on the rhinestone design for 5 seconds. Discount and wholesale pricing listed below. Please review our website for more information on Rhinestone Car Decals, as well as Sequin designs, Rhinestone tattoos and much more. If you have additional questions please do not hesitate to contact VS Rhinestones Customer Service at 866-627-2789.